Equipoise ~ enlightened exercise LLC is a fully equipped Pilates studio run by a fully certified teacher - Lavinia Magliocco, with over 27 years experience. It has been in operation in Portland, OR since 2000. I work by appointment only, generally privately - one person at a time - or semi-privately by arrangement with me. Rates are: $85-$125 per hr, sliding scale, depending on whether I am working with one, two, or three persons at the same time. I do not take medical insurance. I am also available for guest teaching, workshops, Skype sessions, and house calls. Just contact me, see above. Why does it cost so much? You get one hour of my undivided attention, hands-on (if you wish) adjustments and interventions, and professional experience that includes a college degree, graduate equivalent training in psycho-physical therapy, training with an orthopedic surgeon, 27 years experience as a professional teacher, trainer, dancer and finally, the benefit of my own experience of recovering from four major surgeries. My education is backed by years of working with hundreds of bodies in all conditions, as well as my own continual work. No prior experience with Pilates, yoga, or dance is necessary to work with me. I work with anyone, age 10 and up. My oldest client is 94 years old. He began Pilates age 88. So, no, it's never too late. You hate exercising? No problem. We're not going to do eternal, mindless and mind-numbing repetitions of anything. You may not break a sweat for quite some time. You may not even be sore. You will most likely - according to what my clients tell me - feel better almost immediately. You've finished your PT prescription but your knee, hip, ankle, back, etc are not 100%? 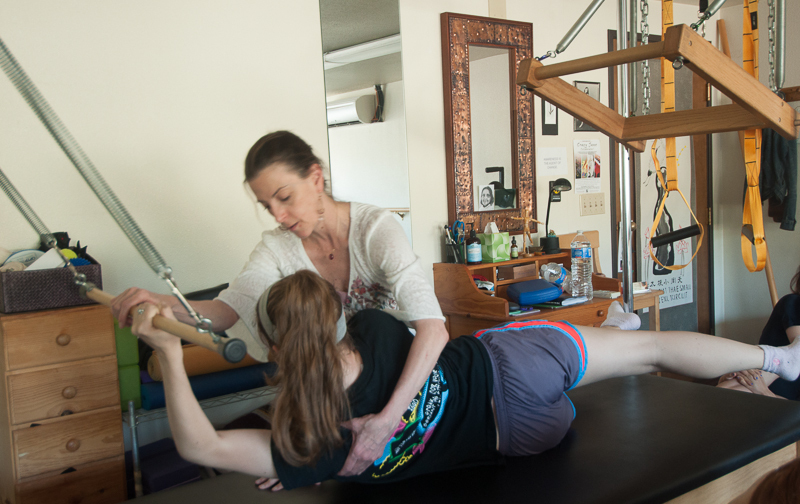 Physical Therapists are restricted by rules and regulations to only help you with what's been injured. Once they run through their prescribed program, once you reach their prescribed competence, as far as they're concerned, you're done. At Equipoise, we don't compartmentalize your body. Everything is connected. So you can continue to strengthen and re-educate your entire body. The injured part benefits, and so does the rest of you. You may even become stronger and more agile than before your injury or surgery. You have chronic pain? I can't promise to make it go away. I can promise to work with you to find ways to strengthen, lengthen, and relieve what's tight and weak, and to help you find better movement patterns. You are not alone.